Also referred to as ENFJ, ESFJ, ExFJ, EFJ, or an Extroverted Feeling personality. While EFJ personality types are often popular, friendly and outgoing kids, the most care needs to be taken to make sure that not just the teacher is a good fit, but that the students in the class also mesh well with your child. Kids with an EFJ personality type tend to be people pleasers who thrive on praise and can be oversensitive to criticism or upset by conflict. They like to dabble in a variety of activities, but prefer to work in a relatively orderly and structured environment. Finding classes that their friends are also enrolled in can be a good way to introduce EFJ personality types to new activities while making them instantly comfortable, since maintaining close, genuine relationships is of utmost importance to kids with an EFJ personality type–just like it is for ENFJ and ESFJ grown-ups. These kids love enrichment activities that have practical benefits for others and where the class structure is a cooperative—not competitive or independent study—environment. EFJ personality types that are musically inclined will do well learning an instrument in a group or individually, because their outgoing natures give them the ability to play in a band with other musicians, and they have no problem performing either solos or in a group, in front of an audience. EFJ personality types also do great in group voice classes for same reasons they do well in dance. They also are particularly drawn to group piano lessons or guitar lessons that include some drums and voice. Kids with an EFJ personality type love playing and singing at the same time, and have the determination to stick with a difficult piece until it’s done. They are also really good at sticking with particularly hard pieces, because they don’t have a problem being on a schedule and practicing regularly. 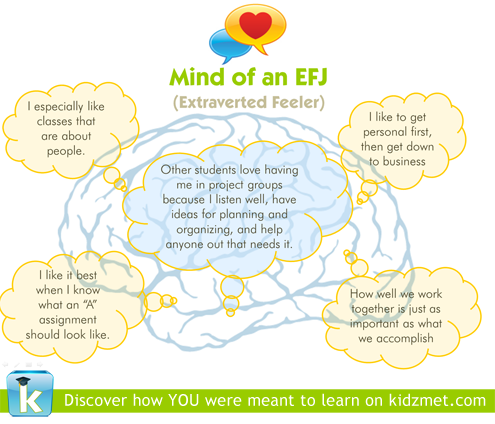 EFJ personality types need to feel that their teacher likes them in order to be able to thrive in a class. (This should sound familiar to ENFJ and ESFJ parents.) If possible, invite the teacher to meet with your child individually for 10-15 minutes prior to the start of the session. If your child does not form a bond with the teacher, there’s a risk that a child with an EFJ personality type will assume that the teacher does not like them. Look for a teacher that is generous with their praise and love for the students in the class, since EFJ personality types need to hear this type of feedback often. These kids’ innate sensitivity and cooperative nature can make dance classes a good fit, especially as they help to rein in or more effectively channel any loud or excitable tendencies. If there is a group that is particularly active in the community from a volunteer or outreach perspective, such as scouting or religious groups, these can be a great fit for the child with an EFJ personality type, as well. Team sports facilitated by the YMCA can also be great outlets for an EFJ’s energy, which encourage cooperative play but do not typically keep score.